The Adventurer's Guide to Successful Escapes by Wade Albert White. Little, Brown, 2016. Paperback/Softcover. 384 pages. 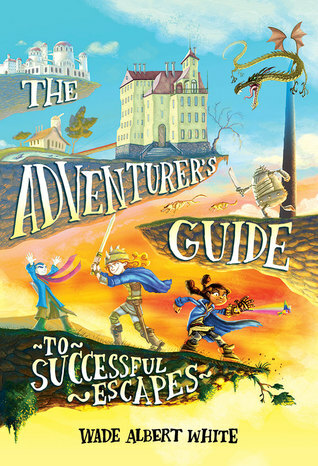 The Adventurer's Guide to Successful Escapes just released this week and if it doesn't become a major hit, then I just don't know what is going on with this crazy world. This book was beyond fun and I enjoyed it immensely. It is full of wit, clever humor, and quirky aspects that make this an extremely strong debut middle grade novel. The characters are wonderfully crafted and the plot is entirely unpredictable and overflowing with twists and turns. Anne, our protagonist, is one of the many orphans living at Saint Lupin's Institute for Perpetually Wicked & Hideously Unattractive Children. Unfortunately, her plan for leaving is derailed and she soon finds herself placed on a epic quest that will take her and her friend Penelope on an incredible adventure. The three main characters, Anne, Penelope, and Hiro, are full of life and incredibly endearing. Each has their strengths and weaknesses, which makes them realistic and relatable. The character development was also done really well, and I liked watching each character evolve and learn about themselves as the story progressed. Not only do we have well-written characters - we also have some fantastic world-building. As weird as this world was, it felt so incredibly real and I found myself completely immersed in wanting to explore more of it. I loved the quirks and history of the world, and I also loved how unexpected it was. As the reader, you really never know what strange thing is about to occur in this world, so it makes for an extra exciting adventure. The witty writing the White employs is reminiscent of Lemony Snicket and Trenton Lee Stewart, but is also entirely White's own style. I really loved that this book felt approachable from any age; it didn't talk down to the younger readers, nor did it alienate older readers by keeping things too 'safe.' The tone and style of prose is written in such a way that all ages can understand and enjoy - it's very smart. If my book were not an ARC and I could add quotes, I would have definitely given you all some samples by now to savor. Since my copy of this book was an ARC, not all of the images and such were there, but from what I did get to see, it is remarkable! I can't wait to grab a copy of the finished book to see how it is in all of its completed glory. I laughed a countless number of times while reading this book, and it truly made for a great bedtime adventure story. Overall, I am giving The Adventurer's Guide to Successful Escapes five stars. This is a must-have book for any parent to buy for their children, for any teacher or librarian to stock for their classroom library/regular library, and for anyone that wants to have a fantastic and highly entertaining adventure story.